This accessible guide offers school leaders a wealth of strategies to foster a culture where educators engage with young people to encourage college readiness and career success. 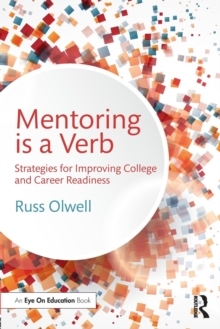 Based in research and best practices, Mentoring is a Verb explains how to build effective mentoring programs as well as encourage educators to individually mentor students. Olwell breaks down the key elements it takes to forge lasting relationships with students and addresses ways to connect to at-risk students. Packed with actionable steps, this book gives you the tools to help your students set high expectations and goals, recognize and address barriers to success, plan for the future, and reach their post-graduation aspirations.